Preheat oven to 400°F. Coat a baking sheet with cooking spray. 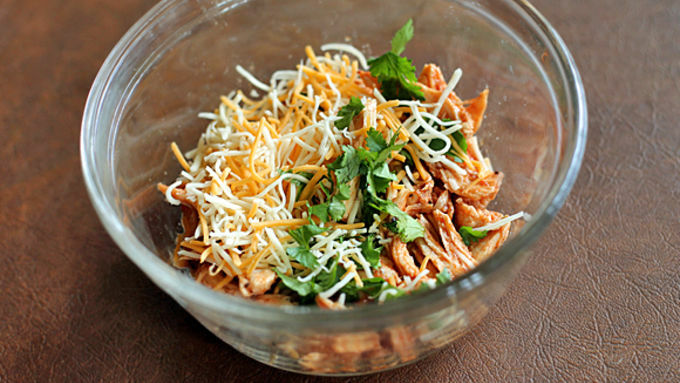 In a medium bowl combine the chicken, barbecue sauce, taco seasoning, cilantro and cheese. Place 1-2 tablespoons of the mixture on each wonton wrapper and bring the opposing corners together. Using a little water, seal the edges of the corners and press together. 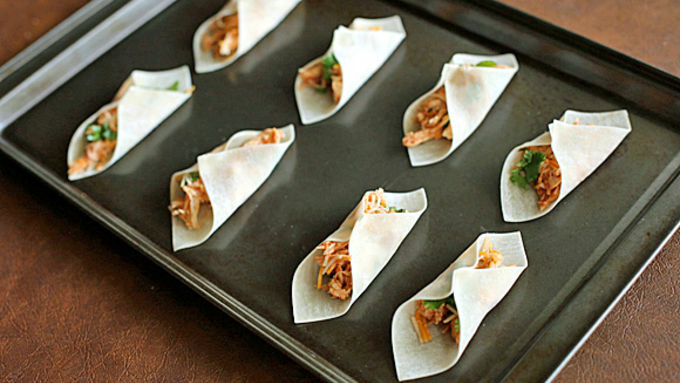 Place on a baking sheet and spray tops of wonton wrappers with cooking spray. Bake for 8-10 minutes or until edges are golden brown. 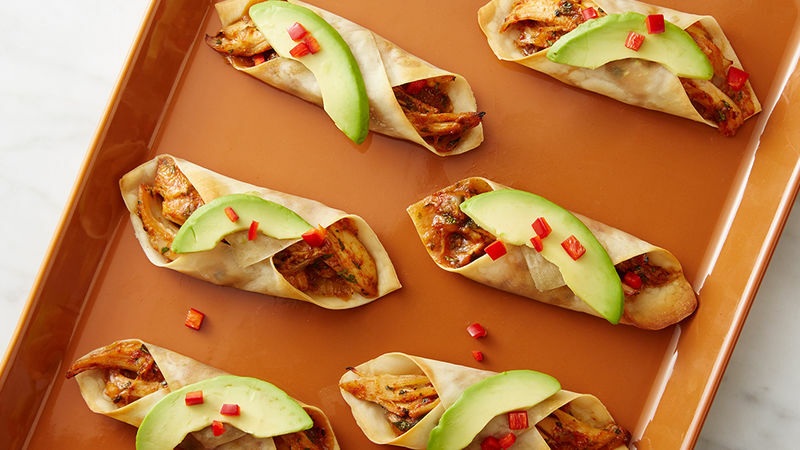 Garnish with chili pepper and avocado. Wonton wrappers are my favorite thing to cook with lately. They're so versatile and almost force you to make mini versions of food. We all like tacos but have you ever had a Wonton Taco? It's like eating your favorite taco except for this one is a bite-sized version of the original... the perfect finger food! 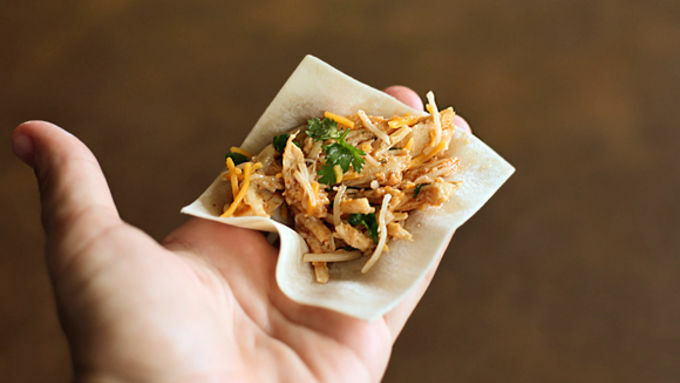 These Wonton Tacos, inspired by Heart, Mind and Seoul start with some chicken seasoned with taco seasoning and some barbecue sauce. I know barbecue sauce sounds like a strange addition, but it adds a little sweetness and kick to the tacos. Some cilantro and cheese are all you need to add that classic taco flavor. 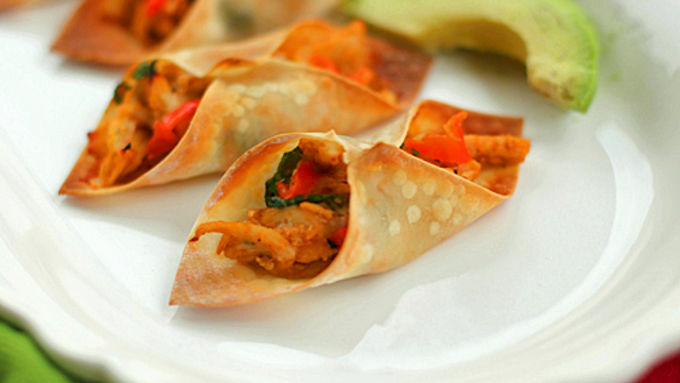 If you want to add a whole lot of heat, top the wonton tacos with some sliced red chili peppers after they have baked. And if your mouth is on fire, add a little avocado to the next taco to cool it down. At least that's what I did!